Electromagnetic conductivity surveys, terrain conductivity surveys, or EM surveys measure the conductivity of the subsurface which includes soil, groundwater, rock, and objects buried in the ground. 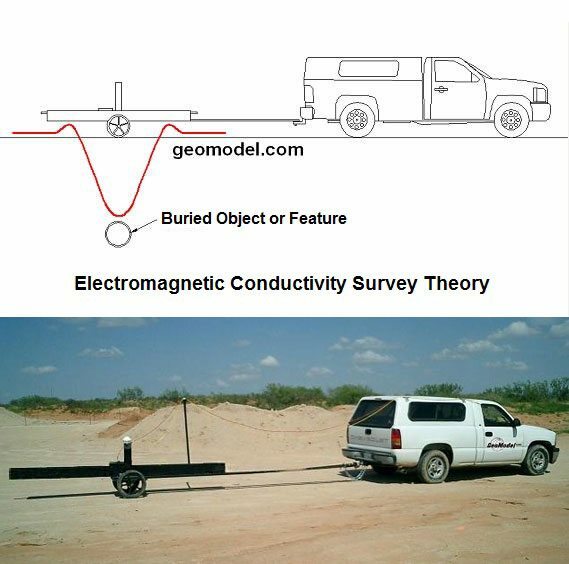 GeoModel, Inc. has conducted numerous electromagnetic conductivity surveys, terrain conductivity surveys, and EM surveys nationwide and worldwide using EM instruments for various applications. Electromagnetic Conductivity surveys, Terrain Conductivity surveys and EM surveys, are useful for detecting buried landfills, conductive ground water plumes and buried metal. Terrain conductivity surveys, electromagnetic conductivity surveys, and EM surveys are conducted by hand or are vehicle mounted and pulled along. EM surveys, electromagnetic conductivity surveys, and terrain conductivity surveys are valuable in real estate purchases, land assessments and contamination assessment studies. Terrain conductivity surveys, electromagnetic conductivity surveys, and EM surveys can delineate landfill cells and determine if contaminated water is flowing offsite from the landfill. 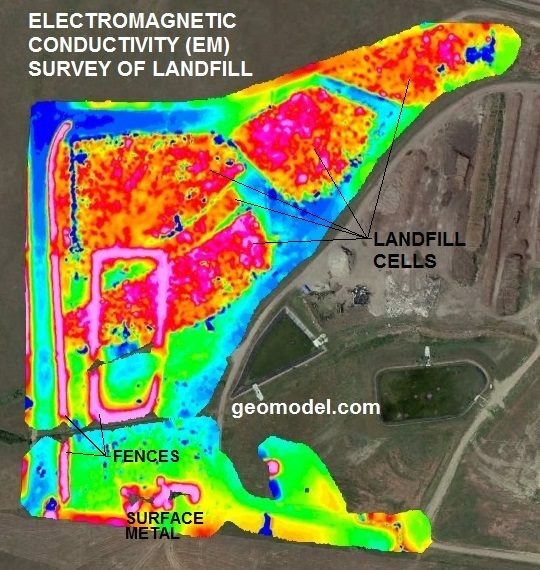 Electromagnetic conductivity surveys can map areas of buried metal common in landfills. A Terrain Conductivity survey or EM survey should be conducted prior to any large real estate purchase to preclude any hidden buried debris or landfill material. A Terrain Conductivity survey can be carried out using a Geonics EM31 Terrain Conductivity meter. By using GPS and a data logger, the EM31 survey can collect considerable amounts of data over many acres of land. 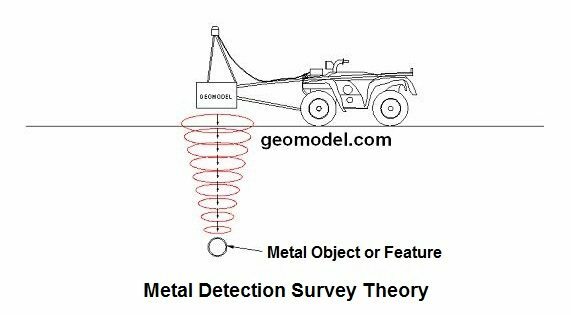 If exact locations of buried metal are required to be determined then a Geonics EM61 metal detector can be used to survey and map many acres of land for buried metal. Electromagnetic conductivity surveys, terrain conductivity surveys, and EM surveys are rapid and very accurate. The instruments are easily carried or moved around the site and are used for a variety of purposes. Underground metal petroleum tanks can be located, metal underground utility pipes can be detected, contaminated groundwater can be mapped, and clay units can be identified. 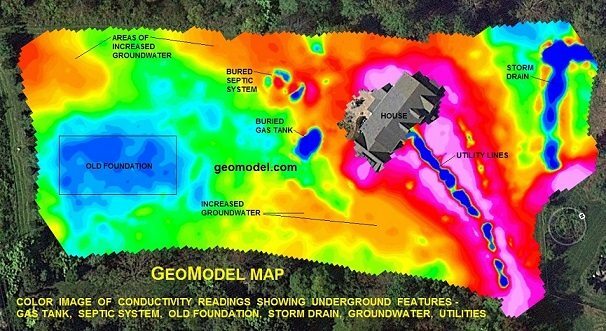 GeoModel, Inc. uses the new EM metal detection system which is twice as accurate as the standard electromagnetic conductivity survey, terrain conductivity survey, or EM survey metal detection system. 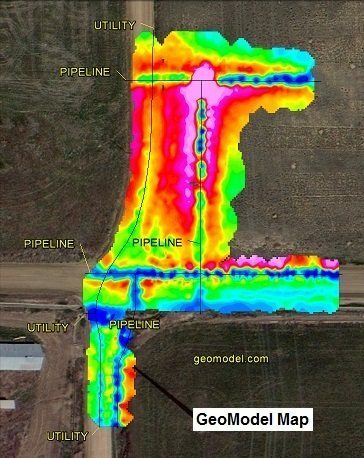 GeoModel, Inc.’s geophysicists can perform an EM survey, terrain conductivity survey, or electromagnetic conductivity survey anywhere in the world and with short notice. Survey costs are reasonable. For a color-contoured GeoModel Map, mapping is done automatically using a vehicle or ATV driven system or a hand-carried method, with GPS positioning. Results of the electromagnetic conductivity survey, terrain conductivity survey or EM survey can be obtained in a short time period, making our system cost-effective for large industrial sites, as well as for smaller sites. Metal utility lines, and most other conductive or electrical utility lines, are mapped using our unique technique.